When designing and testing on data flow task, one of the aspects that is tested is how the data is getting from source to destination data source. While testing the SSIS packages one might encounter issues in the data flow task, one of the options available is the Data Viewer. 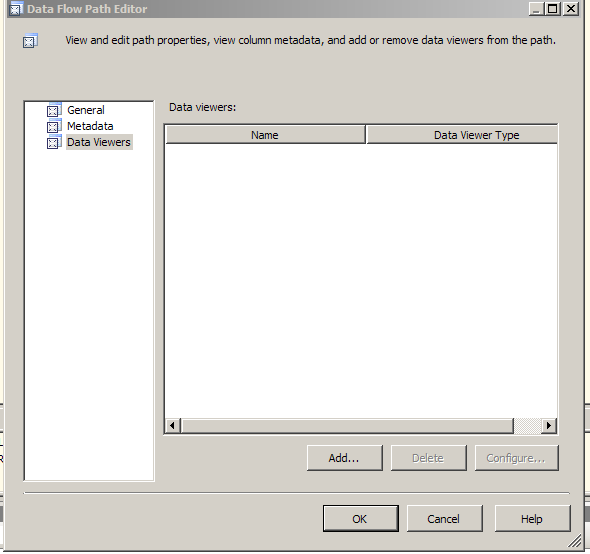 This option can be chosen in the data flow task of an SSIS package. With the Data flow task, right click on the connector which connects the source and destination data sources. Choose the Data Viewer Option, this would open up the Data Flow Path Editor. Except for the Grid option the other three options give an idea o\about the data in a graphical format. In the Grid tab one can configure what columns need to be displayed in the Data Viewer. Once the columns are chosen and click the OK button and exit out of the data flow path editor, the data viewer is ready for use. When the data flow executes the configured data viewer pops up with the column headings and data in a grid.